Ship your skis or snowboards to your destination in this compact, hard-sided case. The telescoping design ensures a perfect fit for your skis and poles. In between modes of transport, use the wheels to maneuver it around the train station or airport. Holds snowboards or several sets of skis. Wheels on one end for maneuverability. Padded, protective foam at both ends. Telescoping design with case pins keeps your gear from rattling around inside. Includes a removable webbing handle. Closes with the included wire case pin, or a TSA approved lock (available separately). Use your own webbing straps to attach it to your car's roof bars. Fits 2 snowboards or 1 snowboard and 1 pair of alpine skis and poles (no longer than 183mm). 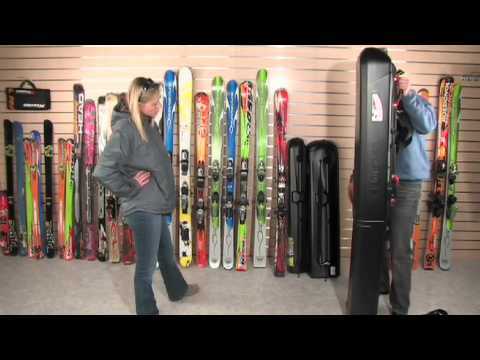 Fits 3 pairs of alpine skis and 3 pairs of poles. 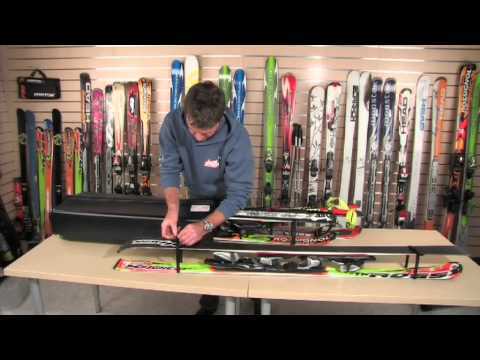 Fits 4 pairs of alpine skis and 2 pairs of kids' skis, but poles won't fit in this setup.